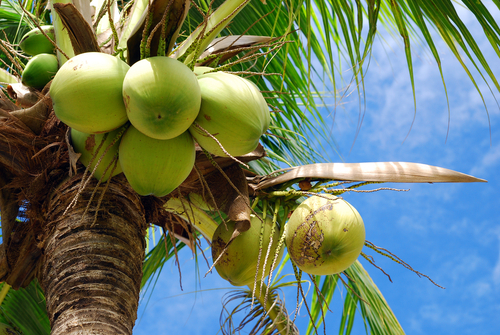 Coconut Water: The Tropical Secret To Amazing Hair, Skin And Health! Coconut water is definitely one of the most underrated health and beauty elixirs. While coconut oil has been everywhere this year, this one is slowly catching up as well! Since I'm a tropical bum at heart, a big old glass of coconut water leaves me hydrated, happy and a little less nutty in the AM. No matter how chirpy you are, living in Bombay and commuting on the local train definitely does take a toll on those endorphins. Sippin’ on some sweet nariyal paani, (at my least favourite Lower Parel station) is how I choose to begin my daily hustle and bustle! While you may not be addicted to this sweet tonic (just yet), by the end of this post… I’m am ready to bet, you will be! The benefits of coconut water extend across skin, hair, and health benefits. Let’s jump in! There is hardly any skin condition that coconut water cannot be used to treat. From facial toner to curing sun-tan, there is nothing for your face that coconut water cannot do for you. Read on to find out more! 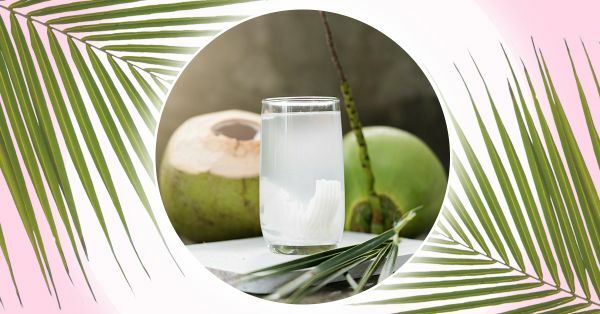 Coconut water from tender coconut is known to have antiparasitic, antibacterial, and antifungal properties that make it efficient for fighting skin infections. Add aloe vera to the mix and you will easily fight off skin infections! Step 1: Take 2 tablespoons of tender coconut water in a bowl and add 1 tablespoon of freshly squeezed aloe gel. Step 2: Apply it evenly all over your face and keep it on for 15 minutes. Step 3: Wash it off with cold water and pat dry. Coconut water is rich in cytokines that promote the growth of new cells in your skin. This enables your skin to regenerate faster and helps maintain the elasticity. On top of that, when mixed with yoghurt, coconut water can moisturize and exfoliate the skin to reduce aging. Step 1: Take 2 tablespoons of unflavoured yogurt in a bowl and add 1 tablespoon of coconut water. Step 2: Apply the pack evenly on your face and keep it on for 15 minutes. Step 3: Rinse off with cold water and pat dry. Coconut water can act as an effective alternative against pigmentation if you’re not in the mood of using harmful chemicals that could potentially further harm your skin. Since coconut water contains vitamin C, so it can be efficiently used in reducing blemishes and tans. Step 1: Mix one tablespoon of fuller’s earth with two tablespoons of coconut water such that it forms a thick paste. Step 2: Apply the paste evenly on your face and let it dry for about 15 to 20 minutes. We all know that hydration is important for our skin. Coconut water can be used as a moisturiser for every skin type, be it dry, oily, sensitive, combination, or normal! Step 1: Mix two tablespoons of coconut water along with half a teaspoon of lemon juice and one teaspoon of honey. Step 2: Dip a cotton ball in the mixture and massage it in circular motions. Step 3: Keep the mixture on for half an hour and rinse off with cold water. Apart from being a natural moisturizer, coconut water is also a source of cytokinins and is rich in antioxidants, lauric acid, and potassium. These ingredients help skin heal and get rid of serious conditions such as eczema. Step 1: Get fresh tender coconuts and extricate coconut water. Step 2: Consume two glasses of tender coconut water daily to treat your skin. While we’ve already stressed that coconut water has rich in antifungal, antibacterial, and antiviral properties, did you know that they also help in taking care of damage done to the skin due to sun exposure? Step 1: Mix two tablespoons of fuller’s earth with one tablespoon of coconut water. Step 2: Apply the paste on affected areas or all over the face. Step 3: Keep it on for 15 minutes and then wash it off with cold water. Coconut water is an excellent skin toner that helps your nourish your skin, heal inflammation, and impart a natural glow. Not only does it help you in getting rid of residual dirt and makeup, but it’s also super good for your skin since its super organic! Step 1: Mix one teaspoon of coconut water with half a teaspoon of lemon juice. Step 2: Dip a cotton ball in the mixture and apply it all over your face. Step 3: Leave on for 15 minutes. Step 4: Wash it off with cold water and pat dry. If you thought that only coconut oil is the only good coconut oil can do to your hair, then you’ve got it totally wrong! Not only is coconut water the perfect after-rinse, but it also helps you in a number of hair-related problems! A coconut water hair rinse gives your hair an unmatched shine and doubles up as a damage reversal conditioner for those who have extremely damaged locks. Step 1: Mix coconut water, honey, and yogurt in a bowl. Step 2: Apply the mixture in your hair by evenly working your way from top to bottom. Step 3: Keep it on for twenty minutes and then wash it off with a mild shampoo. Coconut water also helps in controlling dandruff when massaged on the scalp. Its antifungal properties really help in reducing dandruff and the accompanying itchiness, thus leaving you with a squeaky clean, healthy head of hair. Step 1: Mix five tablespoons of coconut water in half a teaspoon of neem oil. Step 2: Massage the mixture in your hair and focus on distributing it into your scalp. Step 3: Leave it on for an hour and wash it off. Step 4: Repeat it once a week for best results. Coconut water is rich in potassium and other essential nutrients that prevent your scalp from shedding hair unnecessarily while also promoting new hair growth. So drink coconut water regularly to stimulates hair follicle and boosts hair growth! Coconut water reduces bloating and improves your digestion. It reduces the amount of sodium present in our bodies that is responsible for bloating and gas, and its fiber-rich content also gives a boost to your digestive system. Apart from helping with digestion, coconut water is also one of the best cures for dehydration and hangovers. It replenishes the lost nutrients your body loses during dehydration, thus making sure it keeps functioning properly. Coconut water also has a significant amount of calcium and magnesium that strengthen your bones. They help build bone strength and density and is thus great to prevent the early onset of diseases like osteoporosis, arthritis, osteopenia, etc. Athletes drink coconut water after a long workout to replenish their body of electrolytes. Since coconut water is a source of potassium, sodium, magnesium, and calcium, it provides you with the energy your body needs after a workout. Coconut water balances the pH levels in your body and also helps with acidity and heartburn. It has an alkalizing effect on your body which helps relieve symptoms of acidity and heartburn. Drinking coconut water helps you feel full for longer due to its high fiber content. It is a great replacement for sugary aerated drinks! Since it keeps you feeling full for longer, you tend to eat less. Consumption of coconut water prevents the formation of blood clots in the body, and by extension, that of cholesterol as well. So keep those annoying pills aside, for this all-purpose magic drink is all you need to lower blood pressure, hypertension, and cholesterol. While our miraculous human body is capable of detoxifying itself on its own, it never helps to give it some extra attention with some full-fledged healthy detox of our own! Coconut water is great for days when you want to detox. It helps flush out toxins from your system. Coconut water is great for diarrhea. It is high in (all the good) sugars and amino acids which make it perfect to replace all the fluids your body loses during diarrhea. And did you know that it is better than your prescribed ORS? The present minerals, amino acids, fatty acids, and enzymes make this the perfect on-spot treatment. It helps reduce the frequency of migraine attacks in migraine patients. Coconut water is rich in magnesium and it helps keep you hydrated, thereby helping people with migraines and headaches. Kidney stones occur due to the accumulation of crystals in your kidneys that don’t get flushed out through normal urination. Drinking coconut water prevents the formation of these crystals, thereby preventing kidney stones. It boosts your immunity and also helps fight depression. There is 2.4 gm of Vitamin C present in every 100 ml of coconut water making it an extremely beneficial immunity booster against the common cold and cough. The magnesium in coconut water helps treat depression. Research shows that people who suffer from depression benefit from the intake of magnesium. Coconut water is rich in antioxidants, and you already know how essential those antioxidants are for wrinkle-free skin! Not only do they help prevent the skin from getting damaged by free radicals, but they also prevent them from harming your organs in the long run! Since coconut water is so rich in fiber, it can be considered to be a natural laxative. It ensures smooth bowel movements and people who regularly suffer from constipation should drink this first thing in the morning to reap maximum benefits! Coconut water is beneficial for pregnant women and babies too. It alleviates concerns associated with pregnancy like cramps, moodiness, dehydration, nausea among others. It contains traces of lauric acid, which is an immunity boosting compound that is known to be found in mother’s milk. So when nursing mothers consume coconut water, then it’s good for the babies too! Coconut water helps speed up recovery in cancer patients who have been exposed to chemotherapy. Coconut water helps restore the WBC, ANC, hemoglobin, and platelets count in your body. Now that you know all about the possible benefits of coconut water on your skin, health, and hair, now is the time for us to break some common myths related to this magic drink. So read on and be tension free! What Is Coconut Water Good For? 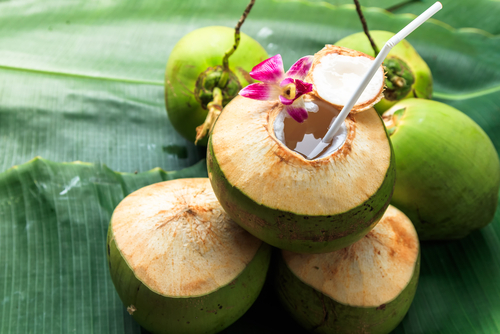 With all the nutrients packed in this drink, coconut water is anything but unhealthy! Regular consumption will not make your skin and hair better, it will also ensure that all your internal organs work fine on within! Does It Ever Get Spoilt? Yes, as the saying goes, “all good things come to an end.” The ideal life of organic coconut water is hardly one or two days, and this is even while being refrigerated. So go ahead and go bottoms up on that glass ladies! Not at all! The entire package of coconut water nutrition not only aids metabolism, but it also ensures that your body retains its natural balance, thus helping you to lose weight quickly! Is It A Natural Diuretic? Yes, coconut water is natural but it doesn’t exactly affect the body in the same way as your OTC medications. While those drugs directly affect the balance of enzymes and electrolytes in your body, coconut water, on the other hand, stimulates the production of urine without laying stress on your hormone or electrolyte levels. Pretty slick, isn’t it? How Much Coconut Water Should I Drink Daily? While one or two healthy glassfuls of coconut water won’t cause you any harm, we suggest you stray away from consuming way too much of it after you’ve sweat generously, for it could potentially disturb the balance of electrolytes in your body! Does It Hydrate Your Body Better Than Normal Water? Now this one has two answers. Under normal conditions, coconut water is as good as your normal drinking water. But if you consume coconut water while working out, then it can significantly enhance your performance by improving your body’s capacity for fluid retention. And you thought coconut oil was the only good thing about coconuts! Coconut water benefits not only your hair and skin but your overall health as well! You do believe it now, don’t you? So have you found yourself a nariyal paani bhaiya yet?